Apprehensive upon noting the name of the artist and the horrific artwork, I took some comfort in the fact that Magic Panda hails from Tigerbeat6, the same home of the excellent Kid606. Jamie Robson hits the listener with euphoria within seconds of opening number ‘Tokyo’; a driving and upbeat collage of harmonious and infectious sounds, over layered pads and beats that drive images of time lapsed traffic speeding through a neon metropolis. ‘A Perfect Circle’ couldn’t be anymore the opposite of its opening counterpart; slowing the pace somewhat, there is a touch of IDM before evolving into overly enthusiastic electronica. 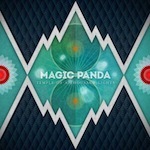 It’s hard to not like Magic Panda, but the choice of VST’s utilised left a lot to be desired personally as this track progressed. ‘Day’s are Numbered’ brings a return to form with a bass line reminiscent of early Bitcrush sound wise. What truly sets this song alive is the key attention to straight-forward evocative harmonies that sets hairs standing on end once the chorus pads come into play, with a tune you simply cannot get out of your head. IDM plays it’s part once more with personal favourite, ‘Mothlight’, drifting at a languid pace as lower end pads are filtered through raindrop-covered windows. As everything speeds up trance elements are thrown against the glass panes providing cracks for the water to seep through and if you shut your eyes, the true magic of this track is its ability to send you to this place as witness to those events. Overall, ‘Temple of a Thousand Lights’ draws on a lot of far eastern exponents of the genre, especially when it comes to sound. This latest release does have elements that let it down occasionally, but in some respects these odd moments of frailty add to the monumental elation you feel when Robson is at the top of his game; luckily for us, this happens to be for the majority of this albums output. This entry was posted in Dense Promotion, Tigerbeat6. Bookmark the permalink.